How do I set up tax? – How can we help? How do I set up tax? The way you set taxes up in Vend depends on whether your in-store prices are displayed inclusive of tax, or exclusive. Stores in the USA and Canada are tax-exclusive. New Zealand, Australian, and UK stores are tax-inclusive. A default tax for your entire store, made up of one or more tax types. A tax rate on an individual product for all outlets. This may be no tax or any of the taxes you've created for your store. 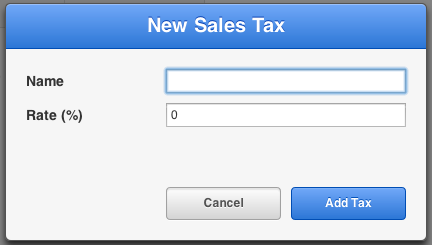 Tax types can either be added from the Dashboard Getting Started wizard, or from the Sales Taxes Setup page. Click the New Sales Tax button. In the pop-up window, name your tax and type in the tax percentage. You've now created a new tax rate and can continue to complete the steps above for each tax rate in your region. Open the General Settings page on the Setup tab. In the default tax drop-down, select the tax rate you'd like to apply. This tax rate is now set as the default tax for your store. IMPORTANT: Existing products will only have their tax rate updated if they are already set to use the 'default tax' for your store. You should confirm your products have the correct tax rate. Once you've set up your default taxes, you can apply a different rate to a particular product. If you are a Xero user, don't forget to set up your taxes in Xero. A tax-exclusive retailer is a retailer who displays prices for products without their tax component. If your store is in the USA or Canada, this will be you. A default tax rate for each outlet. This may be a single tax rate (including no tax), or a grouped tax made up of more than one tax type. A tax rate on an individual product for all outlets. This may be no tax, one tax, or a grouped tax made up of more than one tax type. This tax rate overrides the outlet and store defaults. Your taxes will need to be created before you apply them. 1. To create a new tax rate navigate to Setup -> Sales Taxes and click on Add Sales Tax. 2. In the pop-up window, name your tax and type in the tax percentage 3. Save your tax. Complete this for each individual tax rate in your region. Your store will also have a 'no-tax' 0% rate set. You cannot remove this. Once you have created your individual sales taxes, you can group them to be applied to your store or products. Remember, these will be itemised on your receipts. 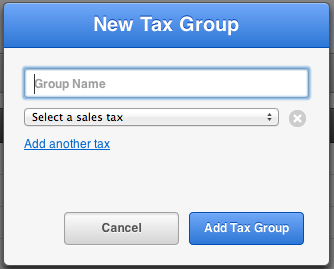 Click on the New Tax Group button. Select the individual sales taxes from the drop down. If more than two taxes are required, click Add another tax to access more drop-down boxes. Complete this for all the tax groups you need to create. Once you've set up all your required tax rates, you need to apply them to your store or products. On the Taxes page, for each outlet listed in the Default Outlet Tax section. You will need set the default tax rate for sales and products for that outlet. Click the Edit Outlet link next to each outlet to set the tax rate. Important: The default tax will not apply to existing products. If you've already added products to your store, you'll need to update these. Don't forget that you can apply a tax rate to a specific product to override these settings. If you're a Xero user, remember to set up your taxes in Xero.